This SEO Link Wheel is a very strong strategy to promote your site. If you need to increase your visibility on search engines & mentions on your site, choose our gig! 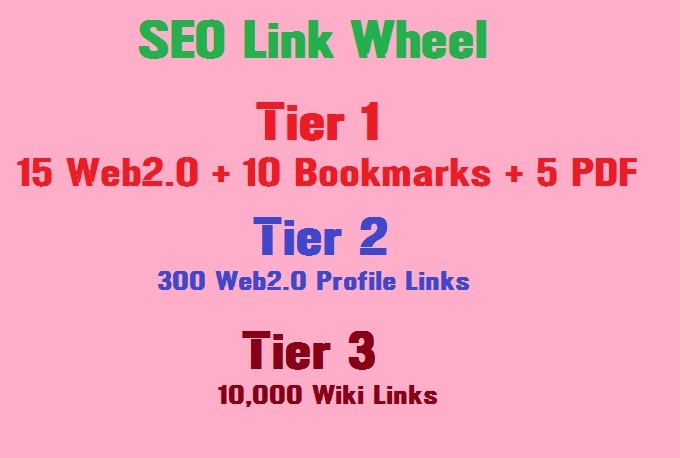 Here in this Gig I will create a Powerful SEO Link wheel For Your website. You just have to provide me any 3 URLs and 4 keywords to optimize. In Tier 1 I will create 15 web2.0 Blog posts with relevant Images + 10 high PR Social Bookmarks and 5 Document sharing backlinks using PR7 to PR9 sites only. I am providing 75 Days replaceable guarantee to all my links. If it deleted then I will replace it with new ones.